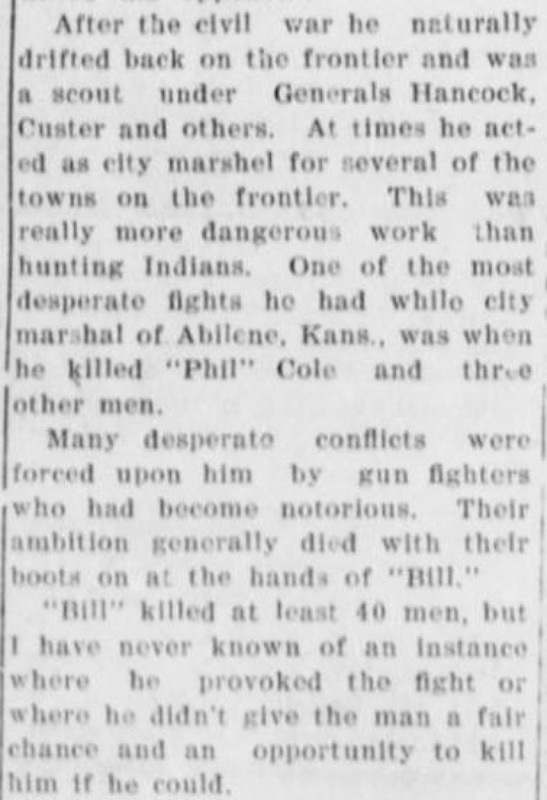 Buffalo Bill, in a recent interview, gave out the following story in regard to "Wild Bill" Hickok, the former Cheyenne resident who was married in this city and was known to many old-timers of this section, says the Cheyenne Tribune. Did I know, "Wild Bill'" (J. D.) Hickok? Yes, most intimately from boyhood. Never was there man more misunderstood by the people of the present day who are impresed by the nickname, as it intimates a crazy thirst for human life. This is a wrong impression. Some consideration must be given to the peculiar conditions that existed in a section that was a more politically and socially volcanic, disorganized locality than even the Balkan regions of Europe today. Besides the natural wild conditions the Indian savage hordes lined up to oppose traffic toward the Pacific, the strife of the brewing free state and slavery question that resulted in the civil war, the drifting toward that quarter of all kinds of adventurers and vicious men from the older sections evading justice, and who thought it a field to let loose the passions in every way, having no legitimate occupation, added to the difficulties. Immediately after the war there drifted in a host of men addicted to all kinds of excesses, and whose actions were almost, one might say, invited by the simple, unorganized and unprotected life then existed among the early settlers. Some idea of the atmosphere in which natives like Hickok and myself had been born can be imagined from this description. Personal responsibility rested on each and every one; everybody necessarily went armed. 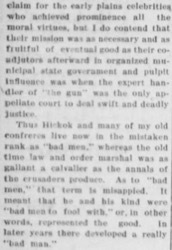 Is it a wonder that peculiar qualities were needed and developed in those who became prominent on this side of law and order—such as Hickok's life evidences? I did not and would not claim for the early plains celebrities who achieved prominence all the moral virtues, but I do contend that their mission was as necessary and as fruitful of eventual good as their coadjutors afterward in organized municipal state government and pulpit influence was when the expert handler of "the gun" was the only appellate court to deal swift and deadly justice. 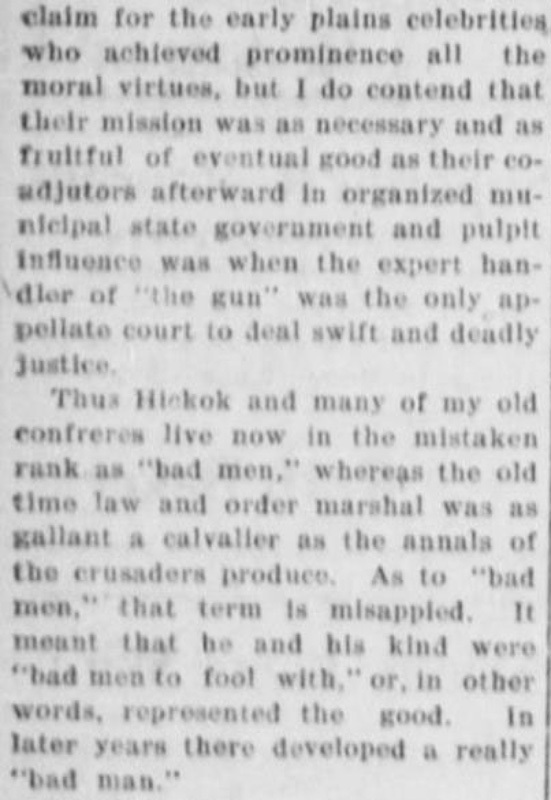 Thus Hickok and many of my old confreres live now in the mistaken rank as "bad men," whereas the old time law and order marshal was as gallant a calvalier as the annals of the crusaders produce. As to "bad men," that term is misappled. It meant that he and his kind were "bad men to fool with," or, in other words, represented the good. In later years there developed a really "bad man." 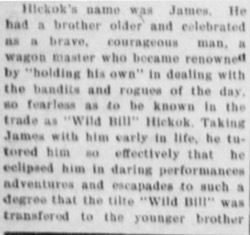 Hickok's name was James. He had a brother older and celebrated as a brave, courageous man, a wagon master who became renowned by "holding his own" in dealing with the bandits and rogues of the day, so fearless as to be known in the trade as "Wild Bill" Hickok. 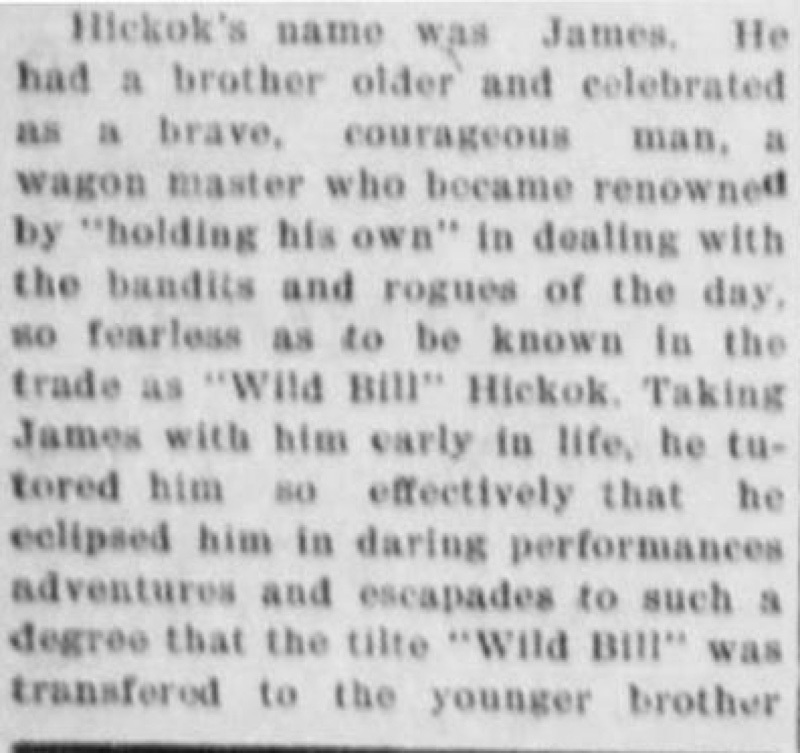 Taking James with him early in life, he tutored him so effectively that he eclipsed him in daring performances adventures and escapades to such a degree that the tilte "Wild Bill" was transfered to the younger brother and has left him thus known forever in the history of the West. 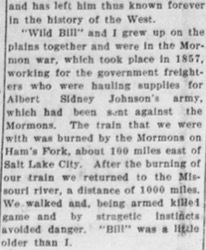 "Wild Bill" and I grew up on the plains together and were in the Mormon war, which took place in 1857, working for the government freighters who were hauling supplies for Albert Sidney Johnson's army, which had been sent against the Mormons. 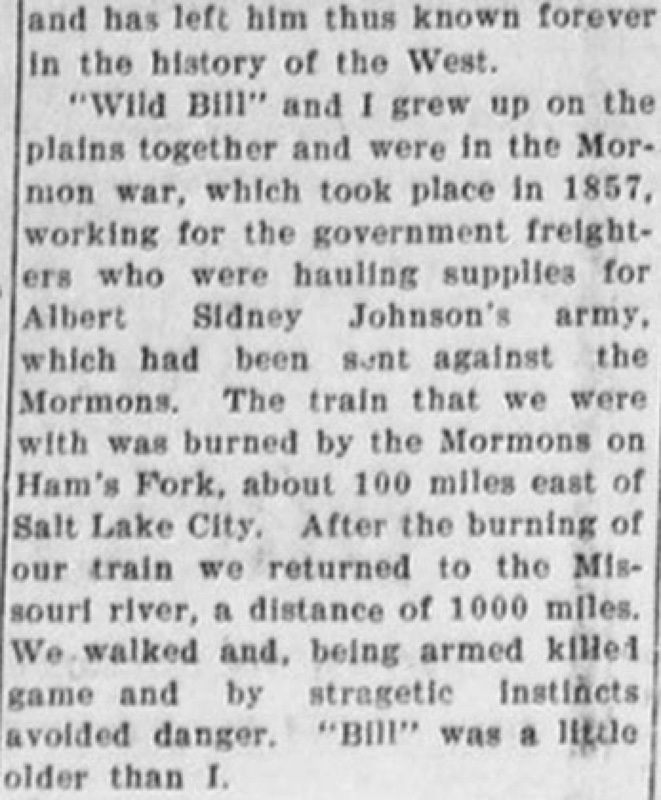 The train that we were with was burned by the Mormons on Ham's Fork, about 100 miles east of Salt Lake City. After the burning of our train we returned to the Missouri river, a distance of 1000 miles. We walked and, being armed killed game and by stragetic instincts avoided danger. "Bill" was a little older than I.
I was a mere boy at the time, and he was very kind, assisting me in many ways. In 1859 and 1860 we were both riding pony express. 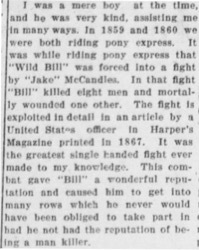 It was while riding pony express that "Wild Bill" was forced into a fight by "Jake" McCandles. In that fight "Bill" killed eight men and mortally wounded one other. 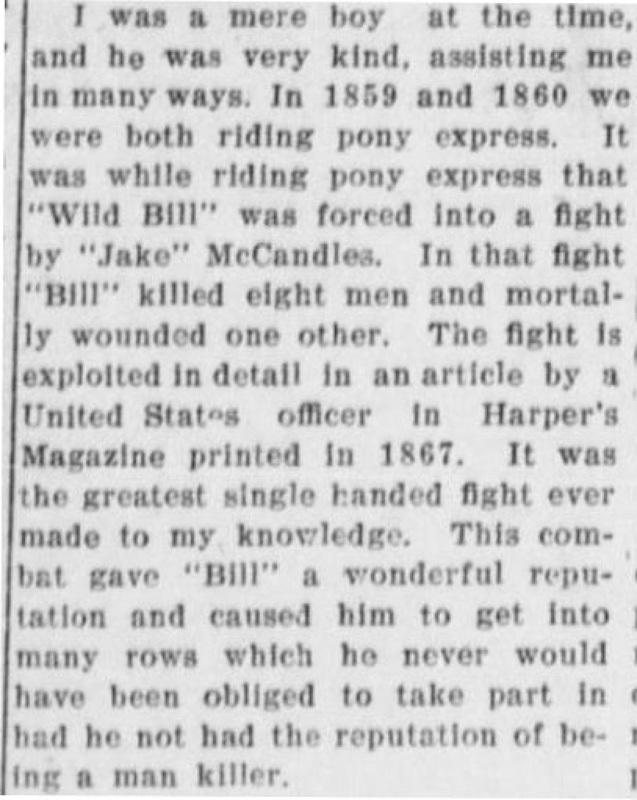 The fight is exploited in detail in an article by a United States officer in Harper's Magazine printed in 1867. It was the greatest single handed fight ever made to my knowledge. This combat gave "Bill" a wonderful reputation and caused him to get into many rows which he never would have been obliged to take part in had he not had the reputation of being a man killer. 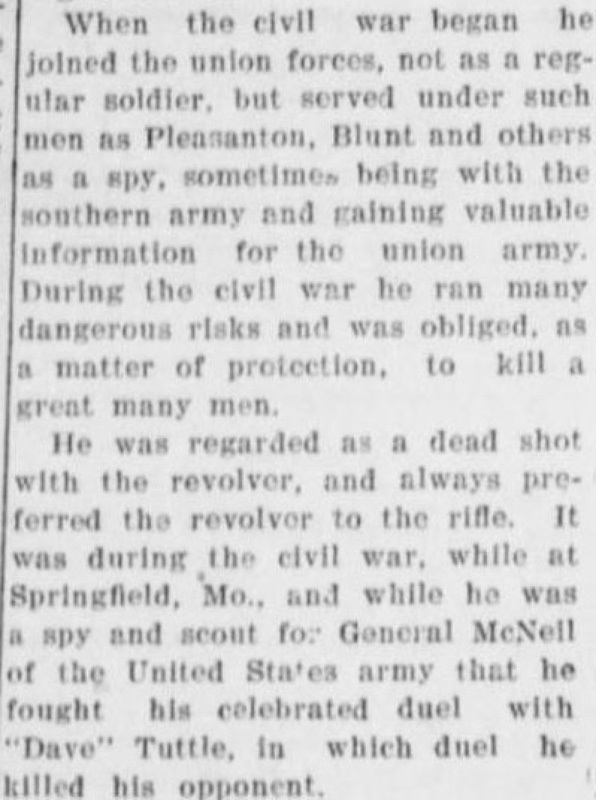 When the civil war began he joined the union forces, not as a regular soldier, but served under such men as Pleasanton, Blunt and others as a spy, sometimes being with the southern army and gaining valuable information for the union army. During the civil war he ran many dangerous risks and was obliged, as a matter of protection, to kill a great many men. He was regarded as a dead shot with the revolver, and always preferred the revolver to the rifle. 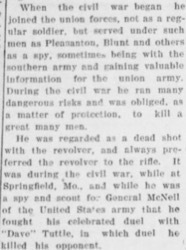 It was during the civil war, while at Springfield, Mo., and while he was a spy and scout for General McNeil of the United States army that he fought his celebrated duel with "Dave" Tuttle, in which duel he killed his opponent. After the civil war he naturally drifted back on the frontier and was a scout under Generals Hancock, Custer and others. At times he acted as city marshel for several of the towns on the frontier. This was really more dangerous work than hunting Indians. 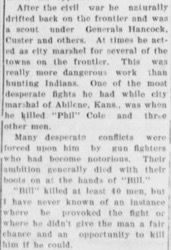 One of the most desperate fights he had while city marshal of Abilene, Kans., was when he killed "Phil" Cole and three other men. Many desperate conflicts were forced upon him by gun fighters who had become notorious. Their ambition generally died with their boots on at the hands of "Bill." "Bill" killed at least 40 men, but I have never known of an instance where he provoked the fight or where he didn't give the man a fair chance and an opportunity to kill him if he could. 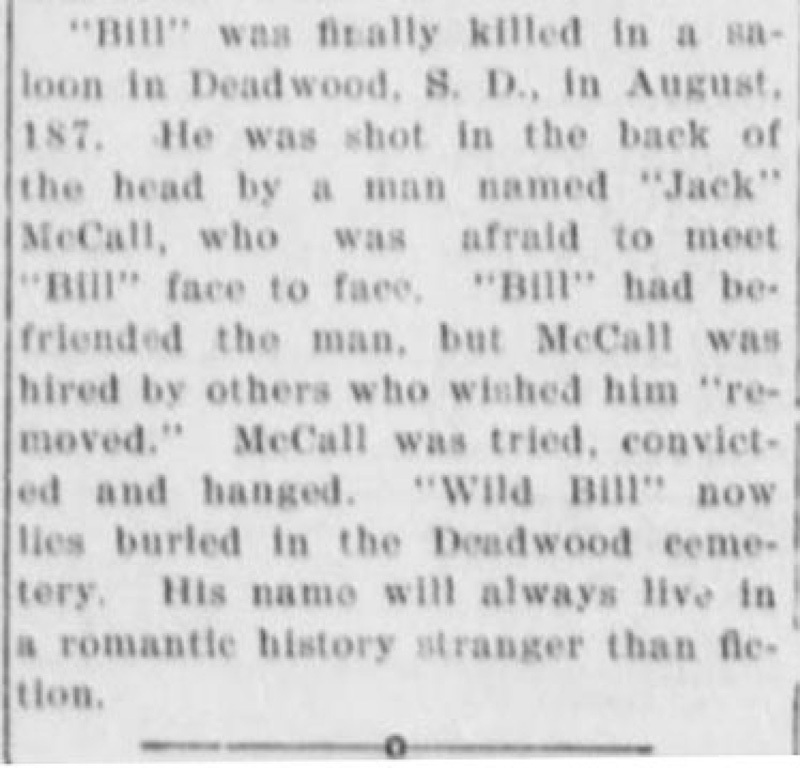 "Bill" was finally killed in a saloon in Deadwood, S.D., in August, 187. He was shot in the back of the head by a man named "Jack" McCall, who was afraid to meet "Bill" face to face. 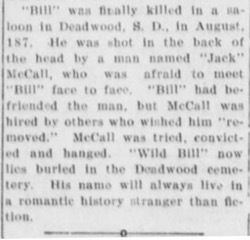 "Bill" had befriended the man, but McCall was hired by others who wished him "removed." McCall was tried, convicted and hanged. "Wild Bill" now lies buried in the Deadwood cemetery. His name will always live in a romantic history stranger than fiction.